The way your customers perceive your brand depends to a large extent on the content you share with them and the way you represent your products in it. Showcasing accurately the best features of what you’re selling is key to a successful brand representation and customer satisfaction. That’s why you need to be able to spend some time and resources on a professional product photography. Before you begin with the shooting process, however, you need to set up everything the right way in order to have a smooth operation. Many people dealing with such a task for the first time, underestimate the preparation that goes into a professional product photography photoshoot. We’re firm believers that you can achieve great results regardless of your photography skills if you are open to learning and prepare well. That’s why this tutorial is dedicated to giving you advice on how you can prep like a pro. The way you present your clothes - how they are modeled and styled-has a huge influence on how your brand is perceived. That’s why it’s important to start from the very beginning and make sure you have your brand guidelines, vision and mission down. To produce great, consistent content that sells, you need to be very clear on what your brand is and what you want it to communicate to your audience. First things first. Before you start thinking about how your content will look, you need to ask questions about who your brand is speaking to. Whether you’re a new brand or going through a rebranding exercise, creating the right visuals starts with thinking about your audience. The way you present your clothes is a big part of your brand and your photographic content needs to reflect that. Outline your brand values, positioning and target audience. What can really help you with finding the right voice for your brand is to put together visual inspiration from different sources like magazines, the web and social media. Also, don’t forget to talk with your marketing department and create a brief for all of your content. Focus on translating this into thoughts on how your photos will be taken and what the end result will look like. You also need to stay consistent. You will have a lot of other marketing collateral that you need to consider. Having a consistent style is useful in making sure your brand stands out and is remembered. This is especially important when it comes to e-commerce. More consistent and higher quality photos of models wearing your products makes it a better experience for customers to shop on your website. Brands seldom stay the same. When it comes to fashion, brands evolve continuously to stay on trend. This is why a strong creative direction is important. Try not to put your brand in a box and create limitations that are otherwise unnecessary and will only block your creative flow. Things have a natural way of evolving so stay open. Set design is an art. Following the creation of your style guide, you probably have a good idea of what kind of set you wish to use or create. For most product photography, a simpler paper backdrop will suffice. After all, it’s first and foremost about about presenting the clothes. When it comes to more creative professional photography and editorial photography, you can start thinking about even more possibilities. Shapes, colours, textures and perspective all come into play to help tell a story. There are plenty of ways you can go about your set. A great place to start is to look or inspiration elsewhere and put together some ideas of what appeals to you and what you think will resonate with your audience. That’s a question that you will have to decide for each photoshoot depending on what the aim of the shoot is and how this will reflect on your brand. One of the more important questions is to decide how to prop once you’ve decided that you want to prop. What type of materials? Where to get them from? How to utilize them to the fullest? There are plenty of options. You can add items made of wood, stage props, stage weights, painted boards, plywood and other objects made out of MDF to your set design. They are typically cheap and easy to assemble. You can choose from a variety of options. Seamless paper rolls are a staple of any fashion photography studio. They come in variety of colours and can give the effect of infinite space when rolled down fully to cover both the wall and floor. If you go with neutral backdrops such as white, beige and medium to light grey are all safe choices. On the other hand, colourful backgrounds can be great for adding some extra life and vibrancy into your photos. Once you have chosen and set up your background, fix it securely into place so no one on set gets hurt. Be gentle when rolling up paper rolls. The chain mechanism can sometimes get stuck - or worse, the paper can rip. If you are hesitating with building your set, just contact a set builder and make sure to brief them accurately. Once you’ve defined your style guide, have thought about the photoshoot and have built your set, it’s time to start prepping for what will happen on set. Start by creating an itemized list. Preparing a list of every item you need to photograph is crucial to running an efficient shoot. Make sure your list is clear, easy to follow, and updated with all relevant information such as style codes and product numbers. Key things to include: sizes, season, color, model to be used, running order, style code / SKU / Barcode, backdrop / set design. Go through all the items you plan to shoot and make sure they are in pristine condition. After receiving your goods - whether they’re straight from the factory or your distributor - unpack and check them against description. Is everything okay with their color? Is everything you ordered there? Are there any major imperfections that will show up on camera? Make sure to go through everything in advance in order to avoid any problems that need solving last minute. 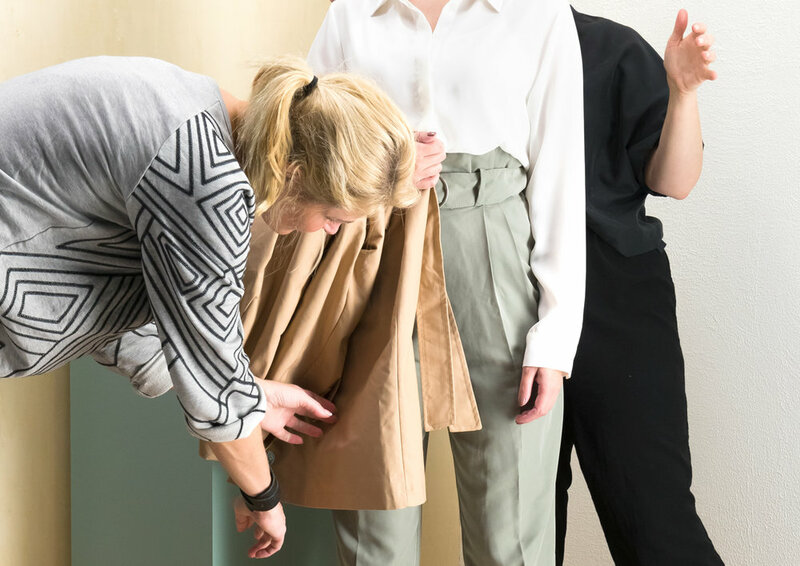 Start by talking to your stylists who will assemble the outfits before the shoot. See if they need anything and if there’s anything that can make their job more efficient. Make sure to sort the clothes in a way that makes sense for your shoot. Steam all your garments before starting a session, ideally a day in advance. Ensure the garment is steamed to its natural shape and isn’t skewed in any way. Keep water in the steamer on standby for items that may need a finishing touch just before being photographed. Also, pay attention to collars, bows or ties. Be sure not to miss the bottoms, edges and sides of garments. Understand which fabrics can be steamed and which cannot, such as leather. For example, an iron does a much neater and crisper job of pressing pleats on a shirt, so be sure to use the right tool for the job. After you’ve sorted your items in a way that works for your shoot, you can go one step further and group products in a way that suits your workflow and product range. Grouping products will work differently for everyone. Consider what is going to save you the most time and energy in your photo sessions. You could group by length for example. It will save you from zooming in and out between shots and ensures consistency in image size. Or you could go in another direction and group by sleeve length. In that case, shoot sleeveless items first and work your way through garments according to sleeve length. This makes handling the mannequin much more efficient.